In recent times it as been said that women are weaker vessels, i guess they don't agree to that. Today women all around the world are making changes and taking over while going global. Women in Tech Week, Port Harcourt. 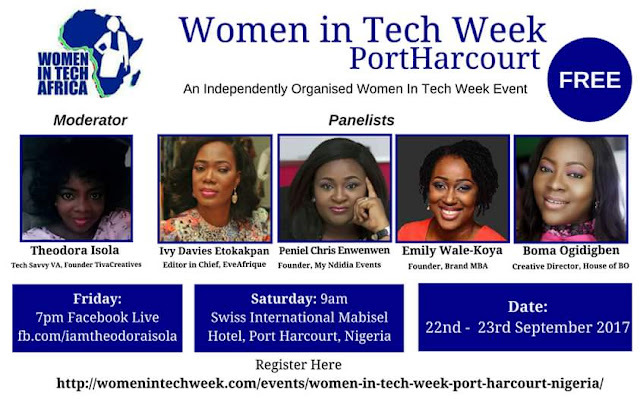 An Independently Organized Women in Tech Week Event is set to hold on Friday 22nd Facebook LIVE (www.fb.com/iamtheodoraisola) and Saturday, 23rd of September 2017 at Swiss International, Mabisel Hotel Port Harcourt, Nigeria. This event is a part of the Women in Tech Week brings together women entrepreneurs and women in the technological space from all over the world and will be a great opportunity for women globally to come together to network, share and empower each other to improve and push forward Africa’s technology growth agenda. If you are a Woman who uses Tech, a Woman Interested in Tech, a Woman in Entrepreneurship and you live in Port Harcourt then plan to attend to celebrate the Women in Tech Week. Women in Tech Africa seeks to build a harmonious community of enlightened women, build consensus, network, learn from each other and provide outside-the-box thinking platforms and not to score acrimonious point, visit unresolvable disputes among members or any other person(s). This event will bring together over 10,000 women virtually with physical events in Ghana, Nigeria, Botswana, Zimbabwe, Ethiopia, Canada, Germany, Belgium and China. I am so excited about this event. Thank you for the sharing.